Graduate student Rebecca Spegal and Danielle Ebeling, a teacher at La Plata Elementary School, have been selected as the recipients of this year’s Dr. Kay Clapp Children’s Literacy Award. The Dr. Kay Clapp Children’s Literacy Award was endowed in 2006 to honor Dr. Clapp, a professor emeritus in the Department of Education at Truman. Clapp is a powerful proponent of literacy and children’s literature. Hundreds of students and practicing teachers have been influenced by her dedication and careful mentoring. The fund provides $500 each to a Master of Arts in Education student and a current teacher to purchase children’s literature for their professional practices. The awards were presented June 7 during a ceremony in Violette Hall. 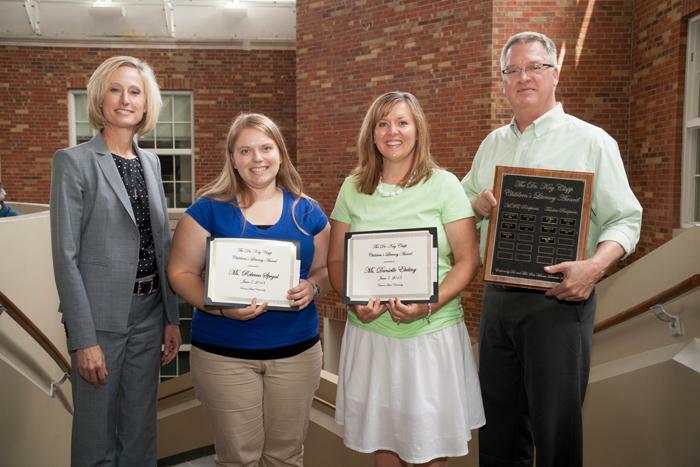 Rebecca Spegal and Danielle Ebeling accept their Dr. Kay Clapp Children’s Literacy awards from Janet Gooch, dean of the School of Health Sciences and Education, and Peter Kelly, chair of the Department of Education. Pictured, left to right: Gooch, Spegal, Ebeling and Kelly. Nearly 65 percent of all Truman student-athletes logged a minimum 3.00 cumulative grade-point average to earn Mid-America Intercollegiate Athletics Association (MIAA) Academic Honor Roll status. Truman had 391 total student-athletes competing in 20 sports throughout the 2012-13 academic year, with 252 individuals (64.5 percent) recording at least a 3.00 cumulative GPA. The MIAA’s 15 primary schools and four affiliate men’s soccer members placed 2,461 total student-athletes on the honor roll, meaning Truman athletes held nearly 10.2 percent of the total slots, the highest percentage of any MIAA program. Thirteen of Truman’s 252 student-athletes were named MIAA Scholar-Athletes, a list designated for those who earned a minimum 3.50 cumulative GPA and were named either all-MIAA in their respective sport, were an all-region/district pick for non-MIAA sports, or qualified for a national meet in an individual sport. Finally, 13 additional student-athletes were granted the MIAA’s Academic Excellence award, which is presented to those who earn or maintain a perfect 4.00 cumulative grade-point average. Seven of Truman’s sports were represented with at least one student-athlete holding a 4.00. There were just 107 total student-athletes throughout the league with a perfect mark, meaning Truman comprised more than 12 percent of the list. The full list of Truman recipients is available here. Students Jacob Caughron, Joanne Chong, Jeananne Pigeon, Megan Recklein and Ashton Wolter represented the state of Missouri at the Future Business Leaders of America-Phi Beta Lambda National Leadership Conference in Anaheim, Calif., June 22-25. These students competed in FBLA-PBL’s national business competition against state representatives from across the United States, Puerto Rico and China. At the Awards of Excellence program, it was announced that Caughron received 2nd place in Marketing Concepts and 6th in Sports Management and Marketing. Recklein earned 4th place in Information Management, 5th place in Project Management and received the Who’s Who in Phi Beta Lambda award. Wolter received 4th place in Business Communication. Truman’s chapter received an award for the second largest chapter in the North Central region and February Frenzy Award. Truman’s chapter also received the Gold Seal Chapter of Merit Award. The competition is part of a competitive events program sponsored annually by FBLA-PBL, a professional association for students pursuing business careers. Individuals, local chapters and state teams compete in more than 50 events representing a range of business, career and leadership development activities. The winners of these challenging and prestigious awards are selected from FBLA-PBL’s more than 210,000 members, and have won regional and state competitions to qualify for the national awards program. The 1,800 delegates to the 61st annual conference elected national student officers and attended business and leadership workshops in addition to competing in business and career skill events. 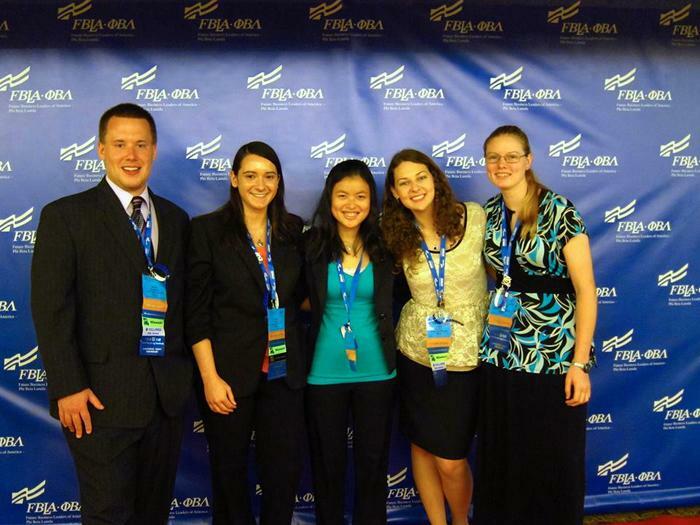 This year’s national theme, “Igniting Innovation,” reflects the goals of FBLA-PBL members. Future Business Leaders of America-Phi Beta Lambda, Inc., (FBLA-PBL) is a nonprofit organization that prepares students for careers in business and business education. Its mission is to bring business and education together in a positive working relationship through innovative leadership and career development programs. Joanne Chong, Megan Recklein and Jeananne Pigeon. Following more than 100 years of competition with the Mid-America Intercollegiate Athletics Association, the Truman Athletics Department became an official member of the Great Lakes Valley Conference (GLVC), effective July 1. Nineteen of Truman’s 20 sports will battle both new and old rivals for GLVC titles beginning this September, with wrestling remaining an affiliate member of the MIAA since the GLVC does not sponsor a championship in that sport. Truman’s official athletics website, TrumanBulldogs.com, will feature a sport-by-sport breakdown, running twice per week throughout the summer to help fans become familiar with the new league and its 15 other institutions. A final recap of Truman’s years in the MIAA was posted last week, with all GLVC-related content beginning July 1. Click here for the Truman State University Fight Song. can be found at social.truman.edu. Abbott & Fenner Business Consultants will be awarding up to $1,000 each year to a scholarship winner. To apply, students will submit an essay on the topic that appears on the scholarship page of their website at abbottandfenner.com/scholarships.htm. The Streamline Refinance Scholarship for Finance and Economics Scholarship is now available. Details can be found at streamlinerefinance.net/finance-economics-scholarship.html. StudentScholarships.org has scholarships available to Missouri residents on their website, studentscholarships.org/2013scholarships.php. Truman students should specifically look for the following scholarships: Gilbratti Scholarship, Youth Volunteer Scholarship Award, Healthy Choices Scholarship, Scholarship by Design Award, Black and Lee Scholarship, Caretenders Scholarship Program, LM Scholarship Program, Rogers Community Volunteer Scholarship Program, Sedary & Associates Scholarship and Lift Parts Express Scholarship. U.S. Bank will award 40 scholarships of $1,000 through a random drawing process. Undergraduate students attending an eligible four-year college or university participating in the U.S. Bank No Fee Education Loan Program are eligible to apply. Further details regarding this scholarship opportunity can be found at usbank.com/scholarship. Students may register for 2013-14 parking decals via their TruView home page. Go to the lower right hand channel labeled “Update and View My Personal Information.” Verify your local address and update your telephone numbers and permanent address. Select “Register My Vehicle” and complete the required fields, specifically your vehicle description and license plate number. Freshman parking permits will be included in the Residence Hall check-in packet if the registration form is completed prior to Aug. 2. Late registrations, commuter parking permits and upperclassmen parking permits will be processed and distributed from the Parking Services Office, General Services Building, 100, located in the Department of Public Safety at the corner of Franklin and Patterson streets. If you have questions or problems getting your parking pass, the Parking Services Office will be open Move-In day, Aug. 17 from 9 a.m. to 3 p.m. There will be expanded Parking Services Office hours 8 a.m.-4 p.m. Aug. 19-22. For more specifics about the Parking Rules and Regulations visit the Department of Public Safety website at police.truman.edu and click on Parking Services. To have an officer dispatched to contact you (non-emergency), call 660.665.5621. This year, all volunteers will report to gate three, the main admission gate on the south end of the fairgrounds, for a gate assignment. To sign up, contact the Public Relations Office at pr@truman.edu or 660.785.4016. On all orientation days, Jazzman’s will be open 8 a.m.-5 p.m. The next issue of the Truman Today will be available online July 15. Michael Goggin, professor of physics, has been appointed director of the Office of Student Research for Summer 2013 and the academic year 2013-2014. The deadline for the Elizabeth Hurlock Beckman Award is 4 p.m. July 15. The Elizabeth Hurlock Beckman Award advisory committee is currently seeking nominations for the 2013 Beckman Award. The award is given to professors who inspired their former students to achieve greatness. Each recipient will receive a one-time cash award of $25,000. Preference will be given to educators who teach or who taught in the fields of psychology, medicine, or law. In 2012, more than $500,000 was awarded to 22 professors throughout the United States. For more information, or to nominate or apply for the award, visit wellsfargo.com/privatefoundationgrants/Beckman.